Here is some WONDERFUL news! Christine, a young woman in the village of Kadawa, developed an ugly condition on the side of her face. She was grossly deformed. This condition is known as keloids (key loyds); they are scar-tissue gone amuck. One of the places they happen is the ear. We aren't certain how hers developed. Most likely she had a wound of sorts on her ear and the scar developed into a keloid. We happened to see her in church one day and asked what had happened to her. We also asked if anything could be done about it. Apparently an unsuccessful attempt had previously been made to fix it. We inquired and found out that a surgical procedure was possible, but she would have to go to Nairobi for treatment, and surgery. Hesbone and Violet approached her and asked if she would consider having the surgery and other treatment to remove the keloid. She agreed. The logistics of finding the surgeons, getting her there, finding a place for her to stay, and the follow-up care are incredibly complex. But they were able to make all of the arrangements and we were able to get her there and back. How they manage to do such things we don't know, but they are an amazing couple who dearly love their people. We just found out that Christine's husband has not had anything to do with her for quite some time - he has been out of the picture entirely - probably for two reasons: 1. The disfigurement was very ugly; 2. Disfigurements or other physical disabilities (deformities, crippled limbs, etc.) are often considered to be the result of a curse. Christine has been home for while, and is under doctors's orders not to be working and lifting and is to take antibiotics and pain medicine (she has been in a lot of pain). The "not working" is very difficult for a village woman and she hasn't been following orders very well; however, Violet has pretty much convinced her of the serious necessity for her to follow the doctor's instructions. She was very upset over the fact that her husband had not come to see her. But she also is very happy with the results of the surgery. See the before and after photos. We are told that the scar has faded a lot since the photo was taken. AND - this past Sunday, her husband came to church, came to the front, and publicly thanked everyone for what they had done for his wife. Yaaaaay! It would appear that her marriage is also being restored. We happened to have money in the budget that made the surgery possible. We were also able to pay for another woman's urgent surgery about two years ago. 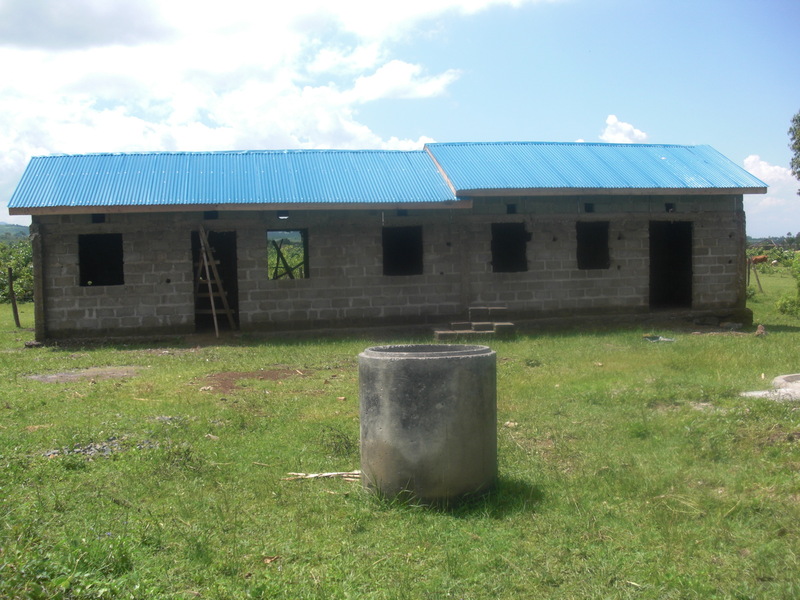 We know that there are many medical needs in the village and, although we have been able to help some of them, we see the real need to establish a hospital/medical fund; i.e., a specific account for meeting hospital and surgical situations. If you would like to help establish such a fund please get in touch with us by e-mail at: johnandmartys@aol.com. We will give you the details for designating and sending it. We have recently been told that there is a serious drought and resulting famine in Kenya. Whereas maize usually sells for 40 Kenya Shillings (KES) for a 2kg tin, it now costs 105 KES per tin - entirely unaffordable for these women (there are 82 KES for $1 U.S. or 141 KES for £1 GBP). But, here is some more WONDERFUL news! 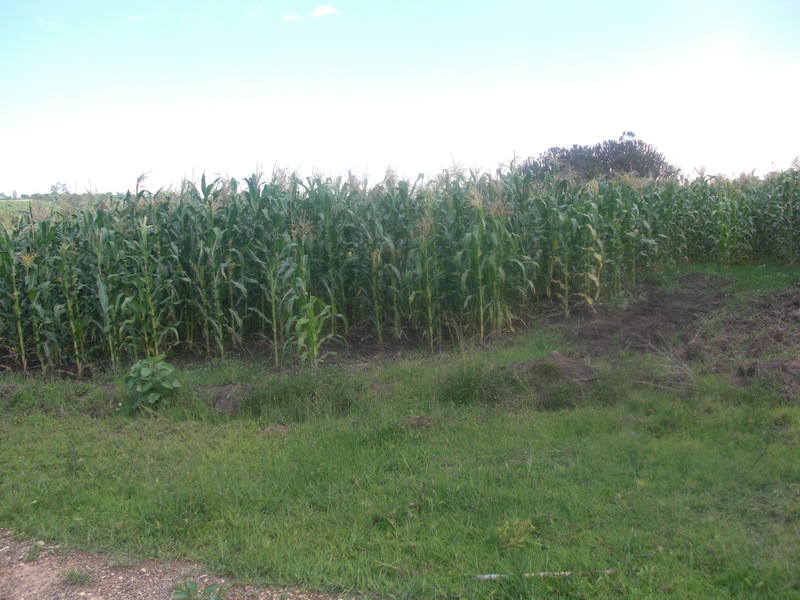 It was reported to us that the destitute widows - for whom the farm is being developed - have been receiving a share of maize harvest from the farm, along with 40 litres of water a week. Lives are literally being saved as a result. We don't know how long the supply will last, but we will distribute it until it is gone. The rains have come and, hopefully, some crops will survive. These very recent photos, taken since the rains began, are of the most recent maize crop on the farm (planted in March). It is so tall and healthy! You can see one of the reasons - we have had trenches dug around the field and across it in a few spots. When it does rain, these trenches fill up with water, serving a twofold purpose. Catching the rain that way keeps it from washing away the topsoil, and the water gradually seeps under the crop to water it. This crop will be harvested in August. The cobs are allowed to ripen and dry on the stalk. 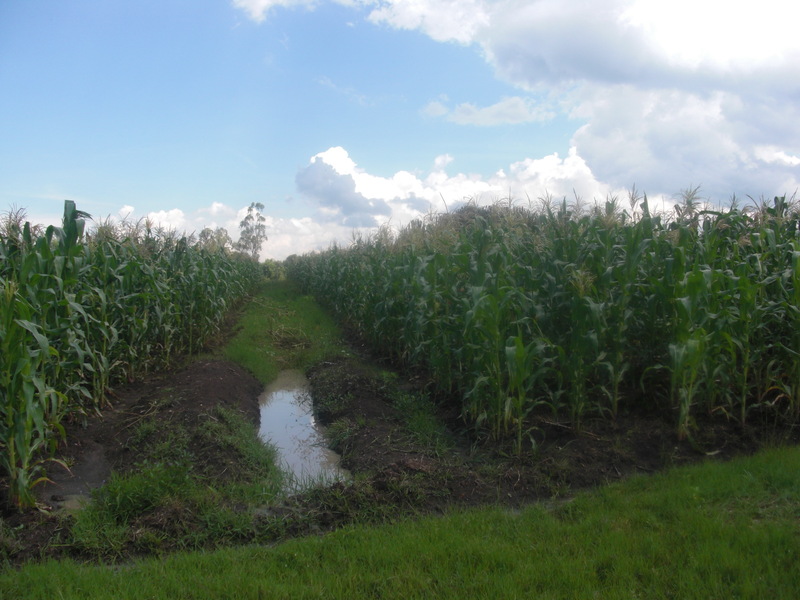 We plan to plow more land for maize and also grow other crops such as fruits and vegetables. Further progress has been made toward the finishing of the house. The roof has been put on, and the doors and window frames have been delivered. There is much to be done yet, such as plastering, painting and wiring for electricity, an outdoor toilet (and Ecosan - more on that later) and a clothesline for the lady of the house (at Marty's insistance). NO, THERE IS NO ELECTRICITY! But, it is coming into the part of the village closest to the market and there is promise that it will eventually get to the church and our land. Therefore, we are wiring it in faith believing that we will have it. Well, there you have our latest news - we hope you enjoy it. We will keep you up to date!